One of my favourite things about attending the races or an event that celebrates Melbourne Cup is its one of the only days where you can dress elaborately during the day along with wearing beautiful millinery. As a self-confessed millinery and racewear junkie who spends hours everyday trawling Instagram, Pinterest and social pages for inspiration, in addition to styling countless women for Fashions on the Field, I’m here to break down what’s hot and what’s not for Spring racing season 2017. There are two types of people in this world: those that are in the racing scene and those that are not. If you are going to be attending the races and participating in Fashions on the field events here are some tips to get you started and to put you in the running for some of the amazing prizes that come with winning these prestigious events. Dress conservatively but embrace trends. Keep your dress length to your knee and below, cleavage to a minimum and at all costs do not show your midriff. To the young women reading this who normally show a lot of skin, you can still be look utterly beautiful and feel amazing in your outfit without showing a lot of skin. 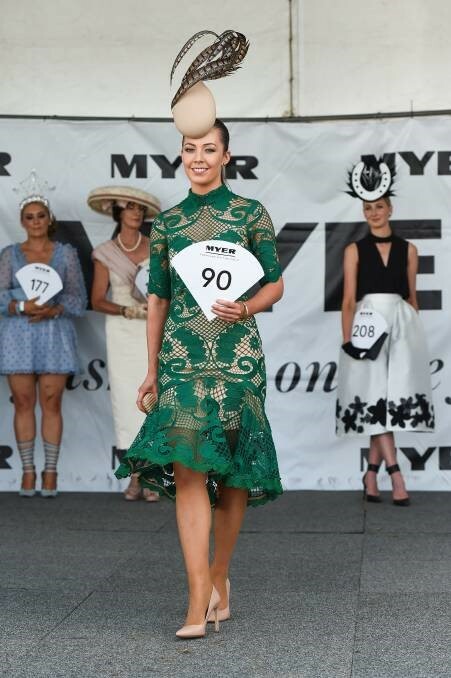 Fashions on the field is a fashion lover’s playground and is your chance to show the judges you understand current trends and how to apply them to racewear. With the influences of haute couture we are currently seeing embellishment (think lace, embroidery and beading), dramatic sleeves, asymmetrical neck lines and thigh splits take over the track. The two stand out colours of the year are red and green. Millinery is a must! Let’s repeat that. Millinery is a must! It doesn’t have to cost a fortune but it does need to compliment your outfit and be season appropriate. There are amazing milliners across Australia with prices starting from $150 - $500+. If you are on a budget why not consider renting a piece of millinery instead? That way you get the look for less. My favourite site to hire for clients and rent out my own pieces is www.millinerymarket.com.au there are so many gorgeous items you can hire for a fraction of what it costs to own one. Your accessories can make or break your entire look. As the owner of an accessories store I can’t tell you how important planning your accessories are, please don’t leave it to the last minute as these items can polish your look to perfect. There are two huge accessories trends this year, the statement earring and the statement bag. Let’s look at earrings first. A statement earring can give old outfits a new lease on life but there are some things to look out for. Don’t buy earrings that hurt your ears. A good way to check is by their weight and what they are made of. Most store owners should happily give this information to you. Tassels are still hugely popular and gold is the metal colour of the moment. The hottest bag of Spring/Summer 2017/18 would have to be the Cult Gaia Acrylic Ark. However, if your budget doesn’t stretch that far, you can get the luxury look of Cult Gaia’s Ark from www.bestdressedaccessories.com ‘Summer Nights Clutch’ which is made from Bamboo. Lastly, if you are new to Fashions on the Field and need a little help why not contact me to receive the personal help of a stylist to help put your entire outfit together.